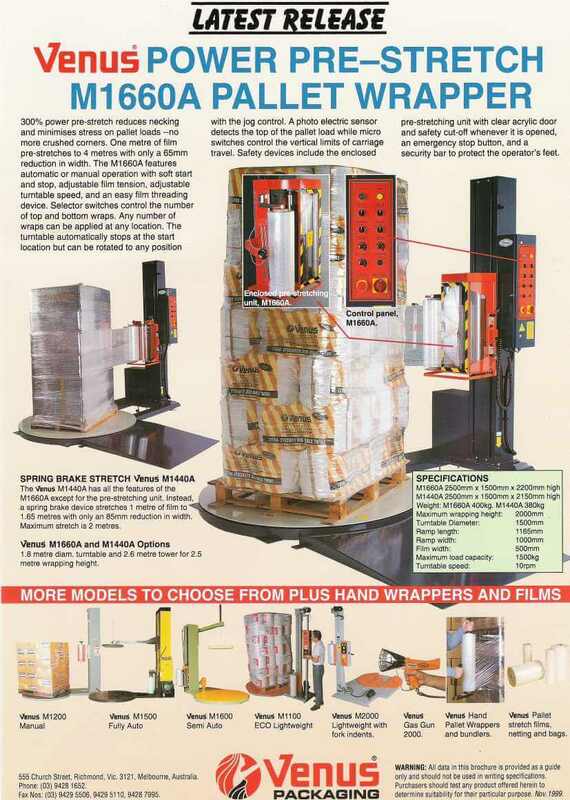 Our range of pallet wrappers includes base models through to fully automatic pallet wrappers with scales and multiple pre-set programs. 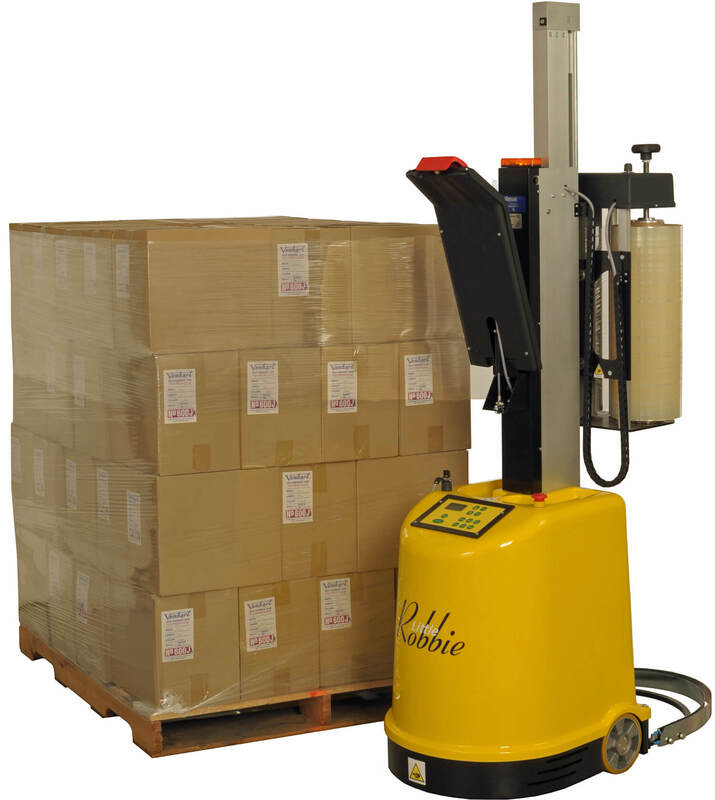 Pallet wrappers in dispatch operations significantly increase output and with more securely wrapped pallets, the likelihood of damaged in transit is reduced. 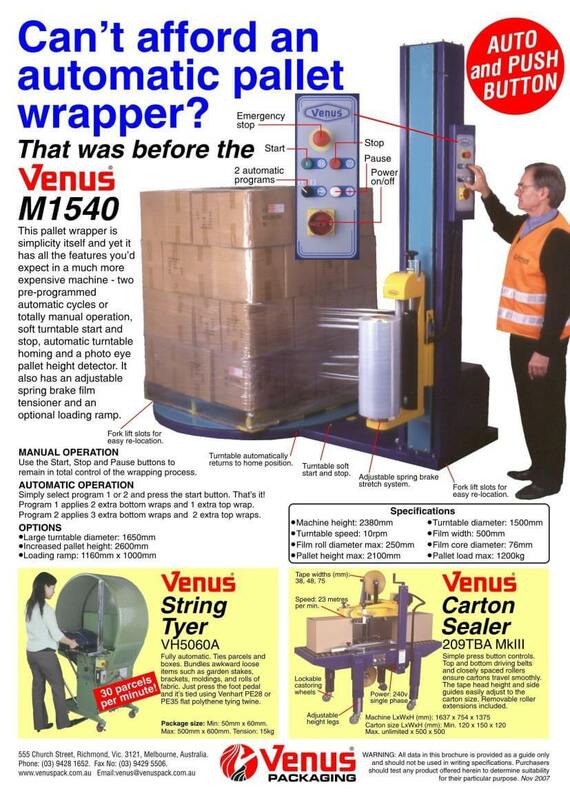 The next level up from the Venus 1540 pallet wrapper, in terms of speed, is the Venus M1580. This comes standard with photocell load height detector, a choice of standard or automatic modes and soft start / stop mechanism. 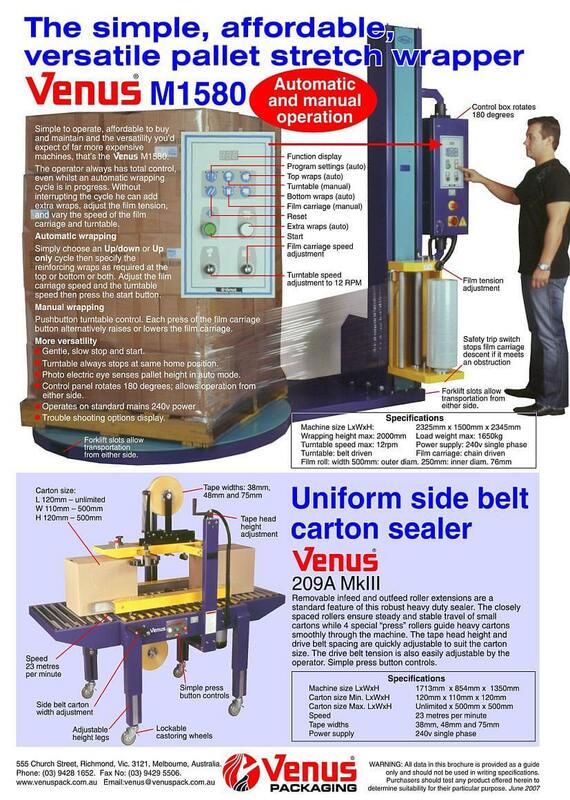 Also available is the Venus Loading Ramp to enable easy loading of pallets onto turntable (see below). Film roll diameter max: 250mm; Film core diameter: 76mm. 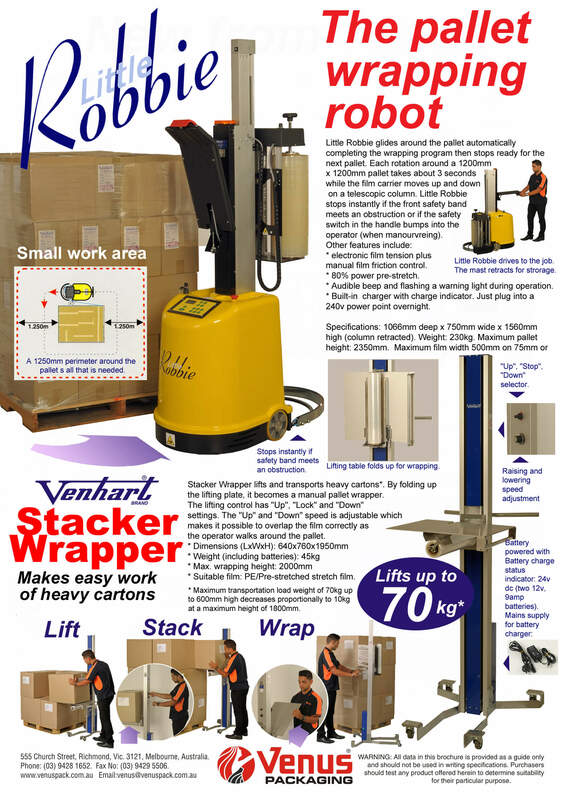 'Little Robbie' Mobile Pallet Wrapper comes with 6 automatic wrapping programs, a telescopic mast to wrap pallets up to 2350mm high & PLC height control. 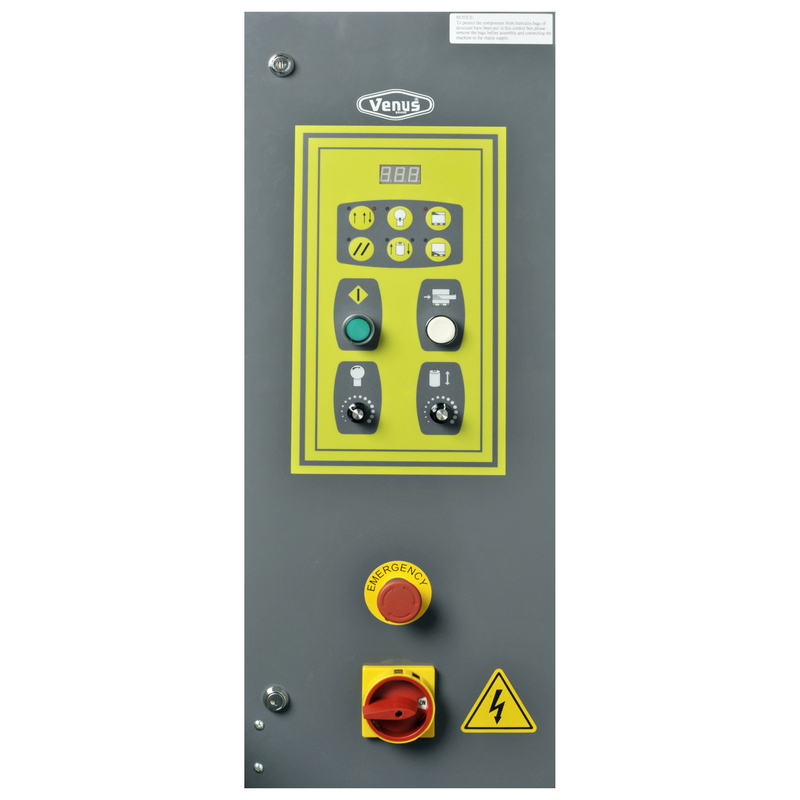 Also comes complete with a 24v rechargeable battery with built-in battery charger. 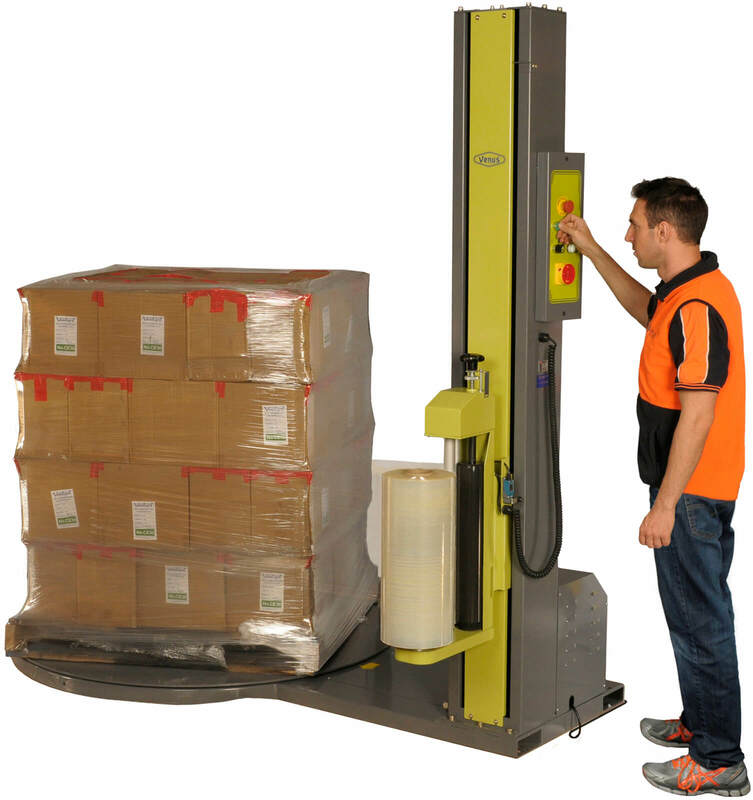 Machine height with mast extended: 2350mm. 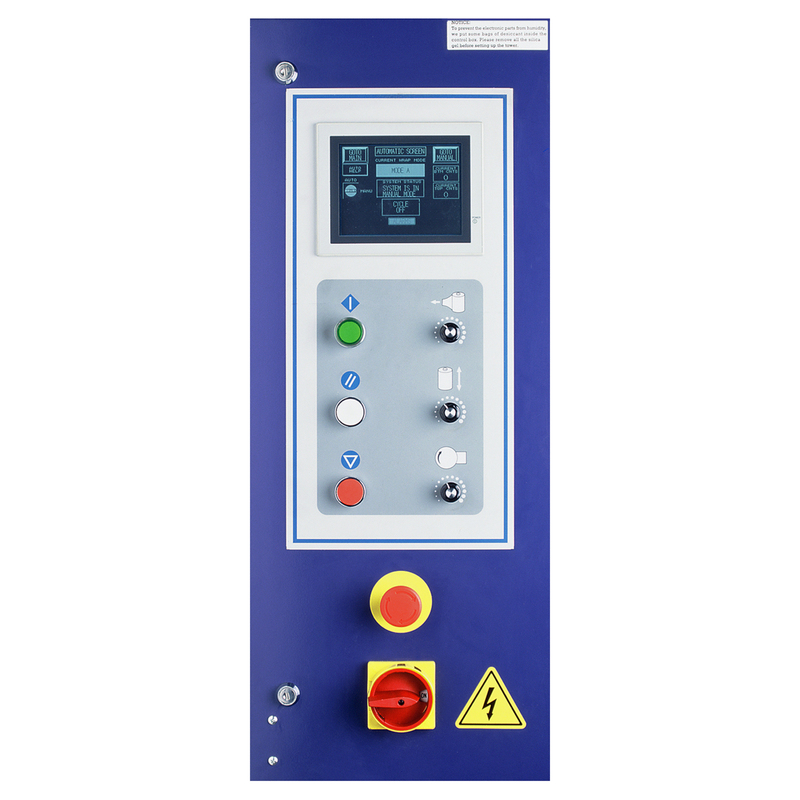 Machine height with mast retracted: 1560mm. Working perimeter around pallet: 1250mm. Film core diameter: 76mm or 46mm. 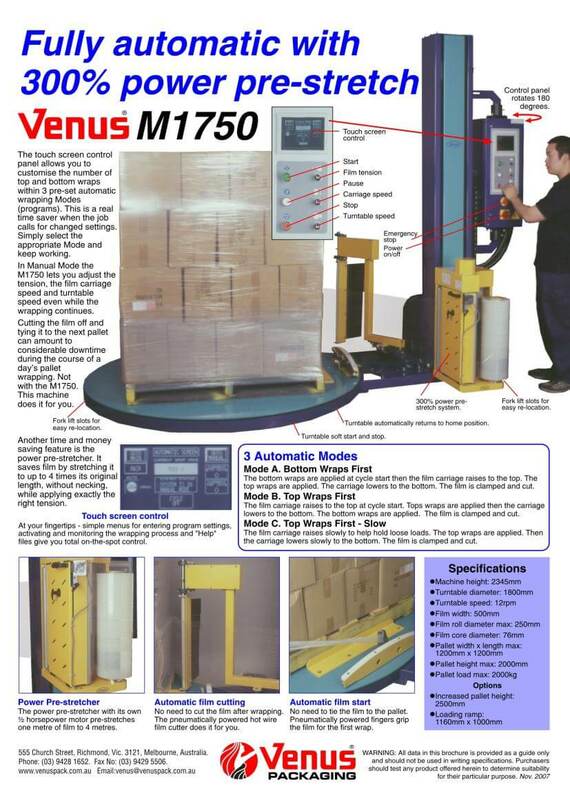 The Venus M1540 pallet wrapper which comes standard with with photocell load height detector, and 10RPM turntable, is the entry level pallet wrapper in our range. 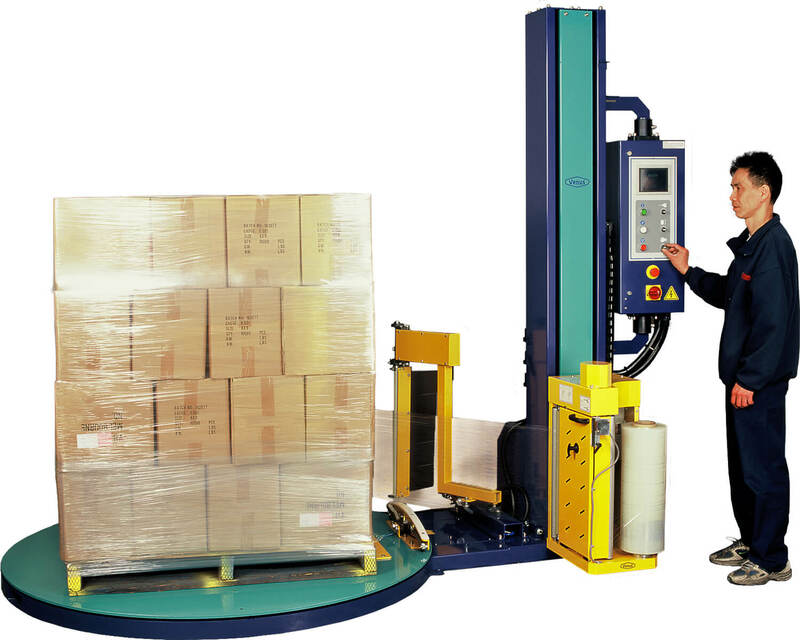 The M1660AW Pallet Wrapper is programmable, has motorised pre-stretch to 300%, takes pallets to 2 metres in height and comes complete with a soft start and mechanism. 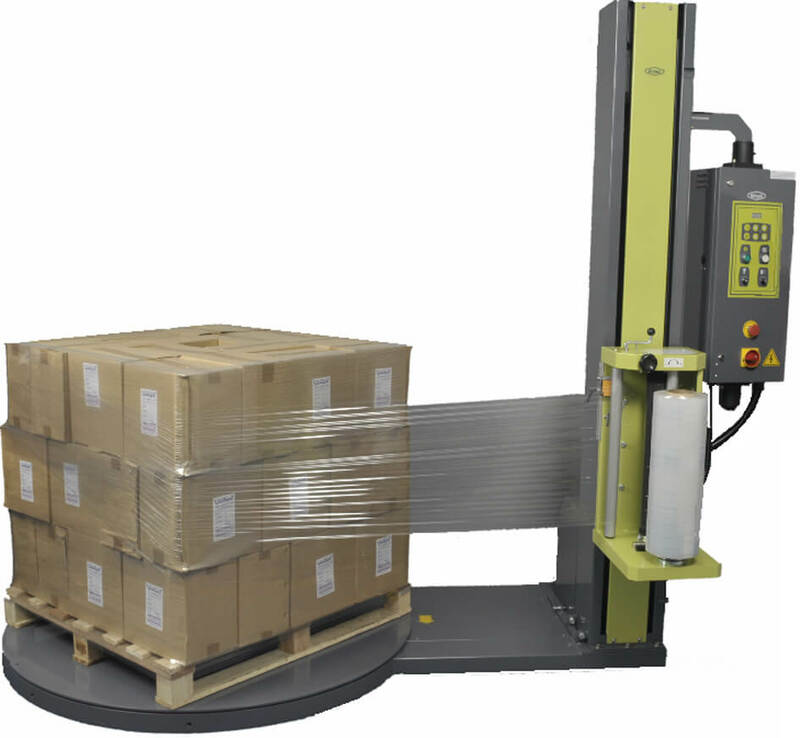 This pallet wrapper also features photocell sensor, adjustable turntable speed, adjustable wrapping tension and load weighing facility. Film roll diameter max: 250mm. 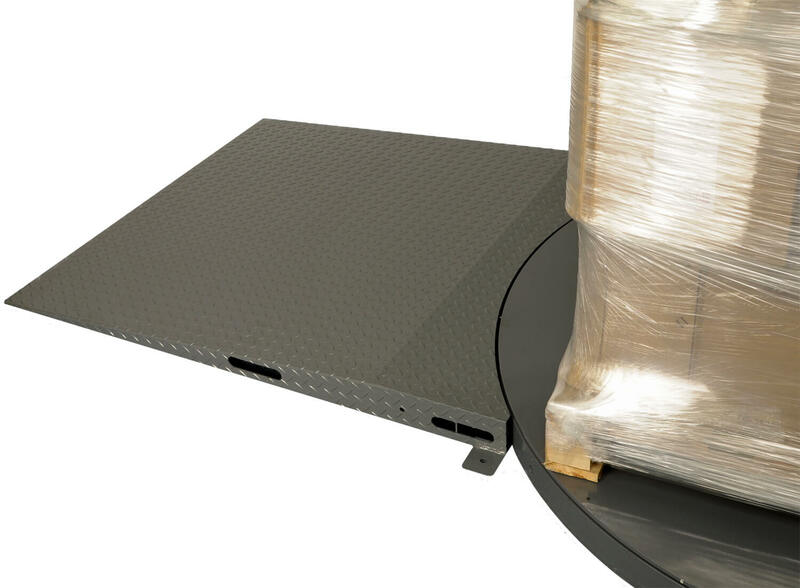 A ramp that attaches easily to the M1540 or M1580 pallet wrappers, to allow pallets to be simply rolled on and off the turntable. 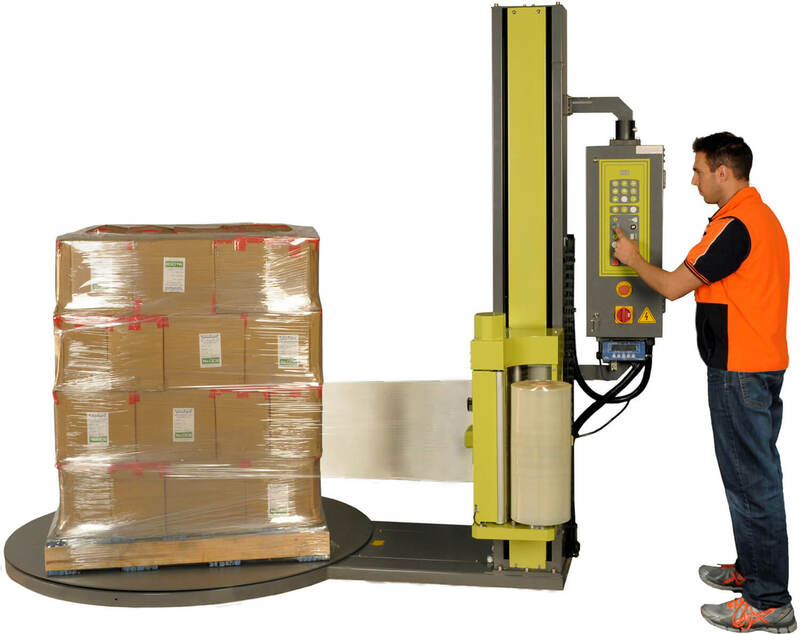 The top of the line M1750 Pallet Wrapper comes with a big 2000kg capacity with a 1.8m wide turntable. Other features include a motorized pre-tensioning function, automatic film cutter and holder and touch screen programming.